"Maharaj" redirects here. For the surname, see Maraj. "Maharani" redirects here. For the music album, see Maharani (album). Mahārāja (/ˌmɑːhəˈrɑːdʒə/; Sanskrit: महाराज; also spelled Maharajah, Moharaja, Moharaza) is a Sanskrit title for a "great ruler", "great king" or "high king". A few ruled mighty states informally called empires, including ruler Maharaja Ranjit Singh, founder of the Sikh Empire, and Maharaja Sri Gupta, founder of the ancient Indian Gupta Empire, but 'title inflation' soon led to most being rather mediocre or even petty in real power, while compound titles were among the attempts to distinguish some among their ranks. The word Maharaja originates in Sanskrit and is a compound karmadhāraya term from mahānt- "great" and rājan "ruler, king"). It has the Latin cognates magnum "great" and rex "king". 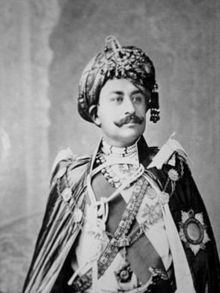 Due to Sanskrit's major influence on the vocabulary of most languages in Greater India and Southeast Asia, the term Maharaja is common to many modern languages of India and Southeast Asian languages such as Kannada, Tamil, Hindi, Marathi, Rajasthani, Malvi, Telugu, Odia, Punjabi, Bengali, Sylheti, Gujarati, Malay and Thai. The Sanskrit title Maharaja was originally used only for rulers who ruled a considerably large region with minor tributary rulers under them. Since medieval times, the title was used by (Hindu) monarchs of lesser states claiming descent from ancient Maharajas. The Maratha Rajarshi Shahu Chhatrapati Maharaj of Kolhapur. On the eve of independence in 1947, British India contained more than 600 princely states, each with its own native ruler, often styled Raja or Rana or Thakur (if the ruler were Hindu) or Nawab (if he were Muslim), with a host of less current titles as well. The British directly ruled two-thirds of the Indian subcontinent; the rest was under indirect rule by the above-mentioned princes under the considerable influence of British representatives, such as Residents, at their courts. The title of Maharaja was not as common before the gradual British colonisation of India, upon and after which many Rajas and otherwise styled Hindu rulers were elevated to Maharajas, regardless of the fact that scores of these new Maharajas ruled small states, sometimes for some reason unrelated to the eminence of the state, for example, support to the British in Afghanistan, World War I or World War II. Two Rajas who became Maharajas in the twentieth century were the Maharaja of Cochin and the legendary Maharaja Jagatjit Singh of Kapurthala. Maharajah has taken on new spellings due to the time change and migration. It has even been shortened to Mahraj and Maraj but the most common is Maharajah and Maharaj. Despite its literal meaning, unlike many other titles meaning Great King, neither Maharaja nor Rajadhiraja ('King of Kings'), nor even its equivalent amongst. Maharaja, 'Maharajadhiraja', never reached the standing required for imperial rank, as each was soon the object of title inflation. 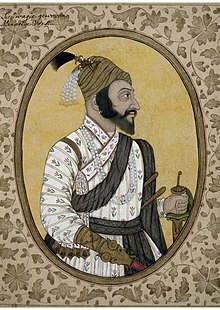 Instead, the Hindu title which is commonly rendered as Emperor is Samraat or Samraj(a), a personal distinction achieved by a few rulers of ancient dynasties such as the Mauryas and Guptas; the Muslim equivalent of emperor would be Padshah (of Persian origin), notably applied to the Mughal dynasty, the Paramount power until the British established their raj. Sawai Maharaja: a title of honour one degree higher than Maharaja Bahadur; as granted (directly) to the Rajas of Ajaygarh. Sri Panch Bada Mahārājādhirāja Prithvi Narayan Shah Dev of Nepal. Maharaj Babu: A Rajput title similar to Maharaja.Used by the ruling Chiefs of Hazari Estate, Dohazari of South Chittagong. In the major, Muslim realm of Hyderabad and Berar, there was a system of ennobling titles for the Nizam's courtiers, conferring a specific rank without any (e)state of their own, not unlike peerage titles without an actual fief in the UK, the highest titles for Hindu nobles being Maharaja Bahadur and Maharaja, above Vant, Raja Rai-i-Rayan Bahadur, Raja Rai Bahadur, Raja Bahadur, Raja and Rai; for their Muslim counterparts there were alternative titles, the highest being Jah and Umara; e.g. the Diwan (Prime Minister) Maharaja Sir Kishen Pershad, held such a Maharaja-title. The Gurkha Kings of Nepal (now a republic) used the title of Mahārājādhirāja which was "Sovereign among Great Kings", a title of honour, a degree higher than Mahārājā. Rana Prime ministers of Nepal used the title of Shree Teen Maharaja. The title Bendahara Seri Maharaja was used by the ruler of Pahang (1623–1853 in personal union with Johor, eventually becoming a fief of the Bendahara family), till on 6 August 1882 Tuanku Ahmad al-Muadzam Shah ibni al-Marhum Tun Ali adopted the title, Sultan. In northern Borneo, the title Maharajah of Sabah and Rajah of Gaya and Sandakan was used from 29 December 1877 to 26 August 1881 by Baron von Overbeck (compare White Rajah). The Englishman Capt. James Brooke was declared as Rajah Brooke by the Sultan of Brunei for his role in pacifying the Sarawak revolt against the Sultan during the Raffles' stint. The word Rajah derived from the word Maharaja. In 1842, the Sultan of Brunei ceded Sarawak to Rajah Brooke who founded the Kingdom of Sarawak and a line of dynastic monarchs known as the White Rajahs. In contemporary Malay usage, the title Maharaja refers to an emperor, e.g. "Maharaja Jepun" ("Emperor of Japan"). In Seri Malayas of the Srivijaya, under the Srivijaya satellite empire of the Majapahit Empire dominated over the whole Malayas far-reaching the present Philippine Archipelago, Malaysia, Brunei, Indonesia under the Srivijaya Empire of the Majapahit King Maharaja Pamariwasa. The latter's daughter Es-kander was married to an Arab (Zein Ul-Abidin) who was a Srivijaya ruler in Seri who were a Srivijaya Monarchy. In the 12th century with the fall of the empire, the Seri King being a Muslim established the Sultanate of Brunei in 1363 with the throne name Sultan Mohamad Shah. In 1426, as his death was recorded in 1431 Mt. Makatangis Sulu grave and 1432 Brunei grave as Sulu and Brunei claim the honour of his grave, he also did established the Sultanate of Sulu while his brother Makdum Karim (Sharif Kabungsuwan of Malabang Lanao), a Srivijaya Johore ruler, later established the Sultanate of Maguindanao-Ranao (Mindanao) after taking the political authority of his father-in-law Tomaoi Aliwya of the Maguiindanao family dynasty. A progeny in 1704, Sayyid Nakhoda Perkasa Angging (Maharaja Anddin) grandson of the second Brunei Sultan Ahmad, the former married to Mahandon the sister of Muwalil Wasit (the 1825 Sulu Sultan Jamaulul Kiram-I), The latter who bigoted the 1839 Sulu Sultan Pulalun. Being childless, Pulalun proclaimed his Crown Prince- Maharaja Adinda Taup (son of Sayyid Nakhoda Perkasa Angging). The title Maharaja Adinda at the beginning of the name to append Sultan. Maharaja Adinda Taup the 1859 Maharaja of the Sulu Sultanate and Prince Heir-apparent of Sultan Pulalun at the time. Sulu Sultan Jamalul Kiram-I (Muwalil Wasit) was the 70 year later descendant of the 1752 three So-called Sultans of Mindanao, namely Kiram Sinsuat, Kiram Misuari and Kiram Sorronga. The latter in 1752, whereby Mindanao was ceded in inheritance to them by their consanguinity-Kinship, the Noble King Luisung Tagean-Tallano. The King of Thailand has been called a "Maharaj" (Thai: มหาราชา). ^ Hansdev Patel (1998). Royal Families and Palaces of Gujarat. Scorpion Cavendish. ISBN 1-900269-20-1. ^ "Entry of the Sultanate of Sulu in the Almanach de Bruxelles."